Abutting the Lincoln Manor subdivision, near a shopping mall that Kenner officials hope will thrive, sits a 25-acre tract of commercial property that once was coveted by real estate developers but today looks more like a wildlife refuge. The Home Depot owns the undeveloped land, which is so badly overgrown that weed stalks, some taller than basketball goals, have completely swallowed a stop sign at 31st Street and California Avenue. 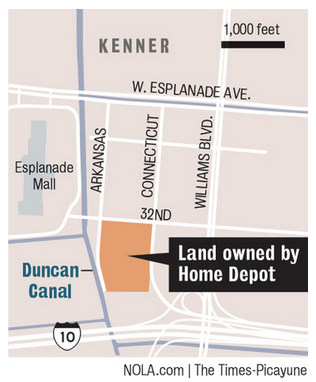 The Home Depot’s land once contained residential subdivisions, but the New Orleans Aviation Board bought out most of the homeowners in the 1990s, to help settle a lawsuit over noise and safety surrounding Louis Armstrong International Airport. The idea, as with all airport buyout property, was to put the land back into commerce.